An early solar cycle minimum? For the last couple of years, signs have been piling up that our star is entering the minimum phase of its activity cycle. There's the obvious decrease in the monthly international sunspot number as compiled by SILSO, but there are other, less-known features which confirm this evolution and even hint that the next solar cycle minimum may be even a bit earlier than expected. These have been mentioned in past STCE news items: the first spots of cycle 25 observed in December 2016 and January 2018, the increasing number of spotless days (SILSO), and the high number of polar faculae observed since the second half of 2015 (here and here). In this news item, analysis of the solar radio emission suggests that the next solar cycle minimum might be closer upon us than what we would expect from the sole analysis of sunspot data. Besides the sunspot number, another well-known indicator of solar activity is the F10.7 index, which is the flux density of the Sun observed in the radio domain at a frequency of 2800 MHz (corresponding to a wavelength of 10,7 cm). The Penticton Observatory, on the west coast of Canada, currently provides the measurements of this index. It corresponds, in principle, to the emission of the quiet Sun (outside flaring events), but it may sometimes be "polluted" by long duration radio counterparts of flares. A long time series is available since 1947, when the first systematic observations began and this is, besides the Sunspot index, one of the longest records of solar activity. When adjusted for the varying distance to the Sun, this index provides interesting clues on the behaviour of the Sun as time goes by. This is the data set we will refer to from now on. The figure above shows the daily adjusted measurements of the solar flux density in Solar Flux Units (1 SFU = 10-22 W m-2 Hz-1), from 1947 till the end of January 2018. 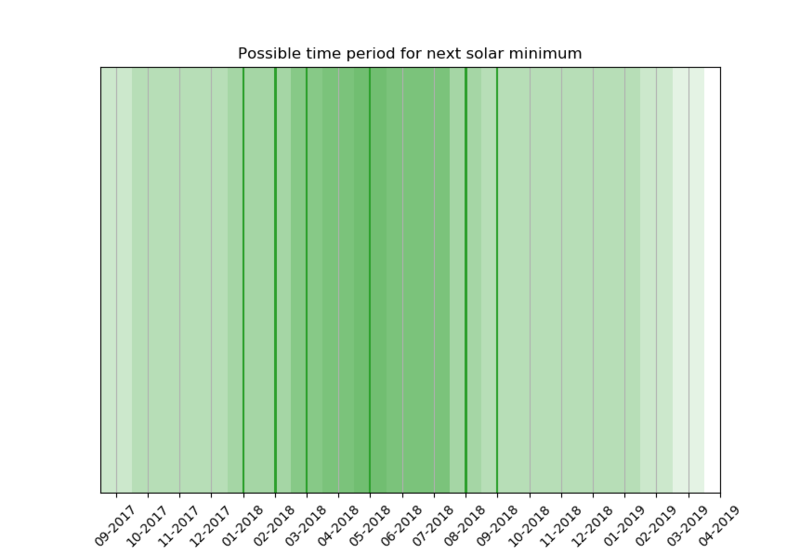 The green dots mark the time of the official minima of the different sunspot cycles (source). 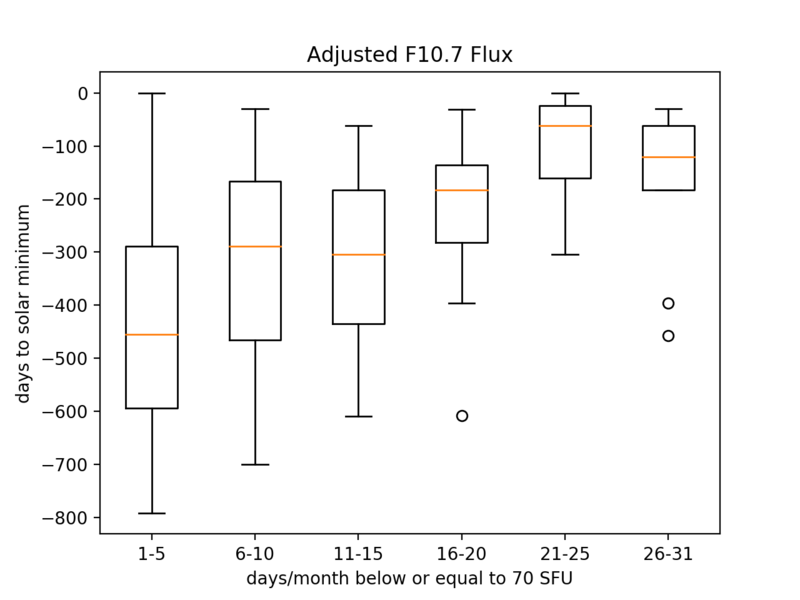 The orange dots highlight the time period when the flux drops below or is equal to 70 SFU. This threshold might seem somewhat arbitrary, but it corresponds to the peak in the histogram of the measurements, meaning it is the most frequent value in the series despite being so low. From this figure, it can be seen that months with values below 70 SFU are clustered around the official solar minimum of the different cycles. If one counts how many days per month are below that threshold since the beginning of the observations, we obtain a distribution of values/month, shown in the figure underneath. There, we can see a collection of box plots, which describe graphically the "shape" of the distributions. Hence, it was chosen to divide the ensemble in chunks of five days ("binning"). 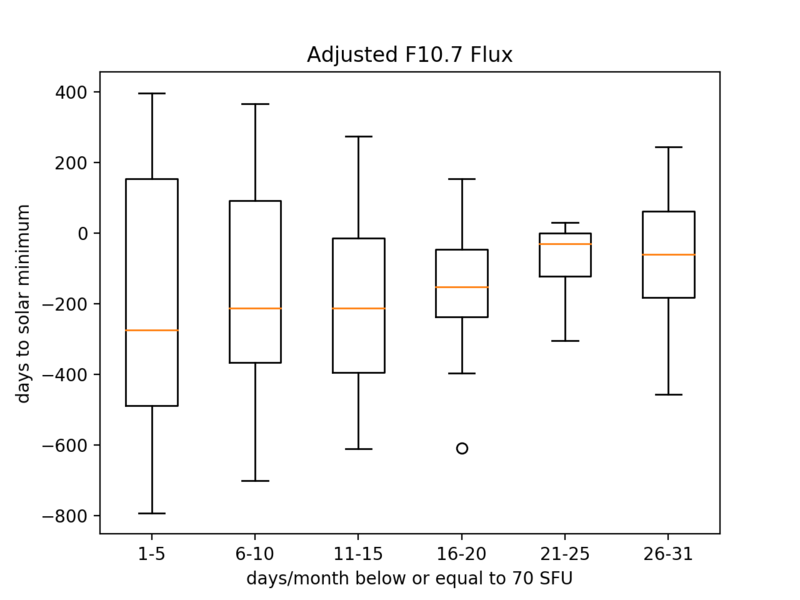 The first one to the left for example, describes how the months for which there were 1 to 5 days with the F10.7 index below or equal to 70 SFU, are distributed in time around solar minimum (in days). The orange mark is the median, the limit of the box represents the 1st and 3rd quartiles, and the whiskers (the "T") are used as a threshold for determining outliers (indicated by circles). More details on quartiles can be found in Wikipedia. In our example (1-5 days/month), most of these months occur a bit less than 300 days before minimum, with a rather large margin from about 500 days before to 150 days after the cycle minimum. Months with values below 70 SFU happening 800 days before or 400 days after cycle minimum are rare ("outliers"). From the above figure, we can also see that values below or equal to 70 SFU are predominantly observed prior to the cycle minimum (each box plot is skewed towards negative values). Moreover, months having many days with values below 70 SFU are more frequent close to the minimum of the cycle. If we redraw these box plots by limiting ourselves to periods prior to the minimum, we then obtain the plot shown underneath. There, we see a more pronounced trend: as the number of days per month below 70 SFU increases, we are closer to the minimum of the solar cycle. Of course, even during a cycle minimum, solar activity can vary significantly from one month to the other. Moreover, the uncertainty margins in the plots are rather large. Can we then reliably derive from these observations a hint for the timing of the next minimum? If one assumes that the current cycle will behave like the ones observed in the past (Note 1), we can project the results shown in the above figure to the current situation. 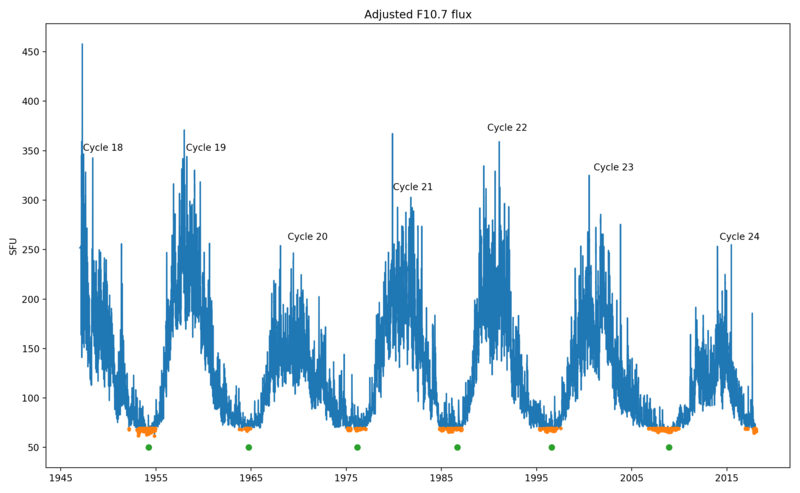 During this solar cycle transit (cycle 24-25), the observed F10.7 values dropped below 70 SFU for the first time in December 2016 (4 days), with the number alternating between 0 and a full month, the latter being the case for January 2018. We can then, from the limits of the boxes and median values of the foregoing figure, estimate the corresponding time intervals for the upcoming minimum. This is shown in the figure underneath. Intervals are green shaded areas which overlap. The "darkest" green area shows the most likely period where the minimum could occur: in this case between March and July 2018. The vertical green lines are the median values of each deduced time interval, with one falling in the middle of the aforementioned period, i.e. in May 2018. Note the uncertainty in the prediction with March 2019 as an upper limit. With these timings, SC24 would turn out to be a rather short cycle lasting barely 10 years. In summary, the main purpose of this exercise was to illustrate the evolution of the solar radio flux density during the period of the sunspot minimum. Assuming that the current solar activity behaviour is similar to that in the past, the next minimum might be right around the corner. However, as past experience has shown so often, our star manages to surprise us time and time again. So let’s wait a little and see how it turns out this time. This news item was prepared by Christophe Marqué (STCE / Humain Solar Radio Observatory) with the help and comments from Jan Janssens (STCE). Note 1 - The previous minimum (between solar cycles 23 and 24) was notoriously atypical for its duration, and would probably not have been forecast correctly based on data prior to cycle 23. Here, the values from the cycle 23-24 minimum have been included.